make it perfect: .She did it. Today I was doing a quick stint of sewing (if I want to sew during the day I have to take 5 minute spurts here and there when I am lucky!) and she came into me and said, "Look at my hair Mum. Isn't it beautiful." This is not an uncommon thing for her to randomly say to me and I absent mindedly replied, "it is Lil, I love your hair." A few minutes later I had to go to my bedroom for something and as I walked up the hallway I noticed long clumps of hair along the way. It wasn't until I reached my bedroom and saw a big pile of beautiful blonde locks on the floor that I realised what had happened. I didn't think I would react the way I did, but it was like my heart stopped beating for a moment and I started yelling, "No Lil, no! It is NOT beautiful hair!!" Haha, I'm laughing at myself now. It was terribly dramatic - I may have exclaimed that it was the worst day of my life and I even started to cry!!! Which made her start to cry (alot) and when we asked her what was wrong with her she said, "I just want my Mum to be happy again"
After a helpful phone call from my hairdresser friend, Pip, I think I am just going to leave it for a little while. I don't want to cut her hair all off - it will be so short and I don't think it will suit her face at all. I'll see how fast it grows in the next few months and then see if I can get a hairdresser to work some kind of blending in magic. In the meantime she will be wearing clips and headbands to try and hide it when we go out!!! Have you had any bad self-hair cutting experiences? What did you do? Is it normal for me to feel so upset??!!!!! Oh no!!!!!!!!!!!! She looks very pleased with herself though. One to save for the 21st birthday photo collection. oh dear!!!! I'm glad you are over it now and able to see the funny side of it. Poor Lil (and you!). Hope it grows out super fast. phebe and eliza cut their hair when i was hanging washing out!! phebe was like Lil's, short and one side only.. Eliza's was VERY layered.. Public holiday the next day. They wore beanies the whole weekend!! LOVE hair cut stories..
OMG I have tears in my eyes reading this post..... My 4 year cut her fringe at the base of her forehead just before she turned 3 I was devastated! The hairdresser couldn't fix it so we just had to let it grow which took at least 8months :o( Her hair is only just getting some length about it now :o) The other day I was sewing and she came out with a big clump of hair and I nearly died.... thankgoodness it was the barbie dolls. Something to make you feel a bit better... imagine how I felt when I realised Isla had chipped her front tooth (like half of it is missing!) when she fell up the stairs! Worse still it has to come out and possibly the one beside it as well because the nerve is damaged and it's still wobbly and it's starting to go black! So my precious little girl is looking like having no front teeth till she's approximately 7 years old :( Yes I cried! Yes Simon thought I was ridiculous! And now I don't feel so silly because you cried about Lil too. I really love their little teeth though. :( Funny thing is the girls are always playing pirates and isla is pirate nasty and now she really looks the part ! My daughter cut her hair when she was little...it grew back gradually & more recently, being a grown up Miss 10, she decided she wanted a fringe. Having super wavy/curly hair a fringe is out of the question! It's growning out slowly!! Thats such a crack up - Lilsy is gorgeous. One of those things thats always hilarious when its not one of your kids. But have been there. Oh Toni I know what it's like! Amelia has tried on a few occasions to do her own hair, the current short hair is not by choice she had a good go with some scissors last year and to fix the NO fringe it had to be cut short, it's still growing back! I think it is a normal reaction I did the same thing cried my eyes out! My youngest daughter cut her hair when she was in 3rd grade. She did it with blunt nose school scissors. She cut about 6 inches of hair and gave herself a pixie cut. When I took her to the hair dresser the next day there was nothing to fix. She's 28 now and (wait for it. . . ) a hair dresser. :) Speaking from experience - hair grows out and your little one is adorable any way she wears hers. Oh Toni! I think you should be able to hide it and let it gradually grow out. Maybe Lil could have a bit of a trim so it looks like it will grow out quicker? One of my boys cut his own fringe and it took 3 haircuts to sort it out. Toni, it looks like Lil thinks she is pretty cool with the new hair do!! It is sad for you though. What did dad say? My eldest daughter cut her fringe just after I had my youngest, very crooked one side to the other. She wouldn't let me near it to level it out, but you know what it's only hair it grows back. ack! Why does almost every little girl do this ???? My daughter cut her hair, at the front, TO THE SCALP!!! Honestly, I was soooo upset too, and I didn't think I would react that way at all. For the next year (because it literally took that long to look normal) every time I looked at her hair I would sigh. The worst thing was the random strangers on the street would look at her and say "OH .. did you cut your own hair??". She would just bow her head every time and look at the floor. I think she is scarred for life. Oh no!! Your reaction is totally normal, I think. Hyrum and Ashton have both cut their hair at different times (and Hyrum has cut Ashton's hair too). I get upset when they do it but they're boys, so I can just shave their hair. If I had a daughter with beautiful long locks I think I would cry too! At least Lil hasn't cut it to the scalp, and if you wanted to even it out I think she'd look gorgeous with a bob. Big hugs to you Tones, one of the joys of motherhood! Oh, and I've also discovered its best to hide all scissors and completely banish textas from our house. Just makes life much easier! oooo, I feel for ya! My oldest daughter cut my youngest's hair a few months ago. She cut some really short bangs and other crazy cuts into it, in just a few minutes. I do laugh about it now, but all I could do was stand there totally shocked when it happened! My daughter did not do her own hair my son gave her bangs a trim till they were barely 1/2 inch long. He used a child's safety scissors to do it??????? NO idea how. She was only 1 1/2 years and he was going on 4,I had a heart attack and reacted just as you did. There was no camouflaging that mess however. The same thing happened with my flower girl the night before my wedding! 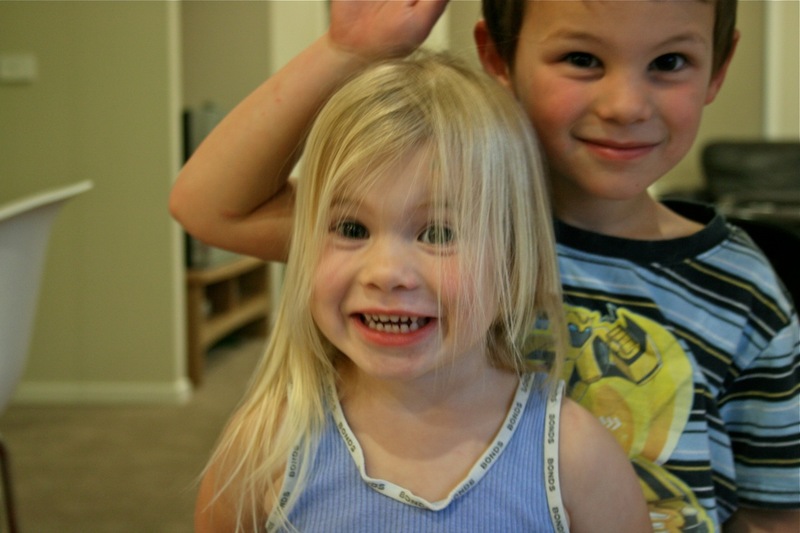 Both my girls grew their hair out until about age 9 or 10 and yes, I cried when both had their locks cut off. sigh! I think a bob would be cute, it will grow back fast, and you won't believe how much easier it will be to take care of. It will be a lot thicker growing the second time also. Cheer up! As my girls tell me -- Mom, it's just hair! That reminds me of the time my daughter cut her hair. I had just taken her to the salon to have her hair trimmed and bangs cut so she must have gotten the idea from that. Two days later she came out of her room with long pieces of hair falling out and some on her clothes. She had dound a small scissors and had cut the hair off of all her dolls and then started on herself. She had hidden handfuls of it in her room so she knew she shouldn't have done it. Then when I asked her who cut her hair she promptly said Matt did it (that's her brother) But Matt was in school at the time. I was so surprised at the way she blamed her brother because she was only 3 years old. 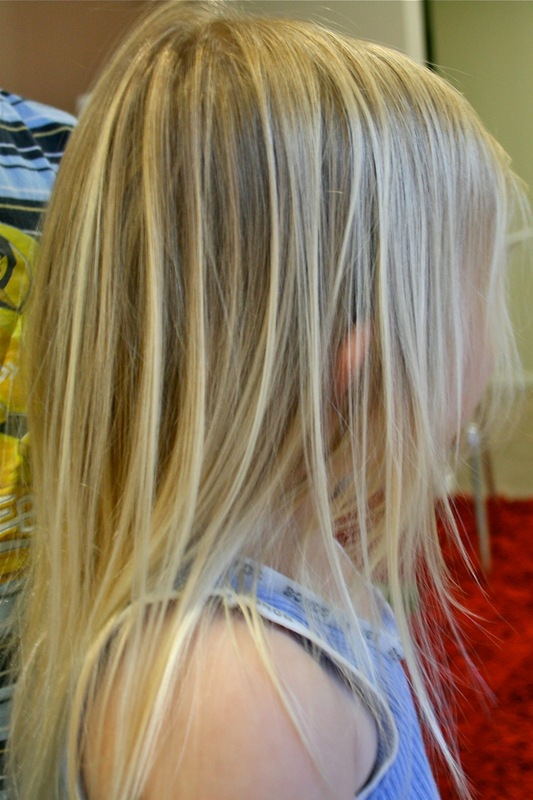 I have 4 boys, so I can't imagine what it would be like for a little girl with long hair to cut it. It must be hard. I am a hairstylist and I my favorite haircut (it suits almost all face shapes) especially for little girls is the angled or graduated bob (see a pic here: http://hubpages.com/hub/Find-Your-Perfect-Bob-Haircut-Variations-on-the-Bob - the 2nd pic down). It looks so cute. 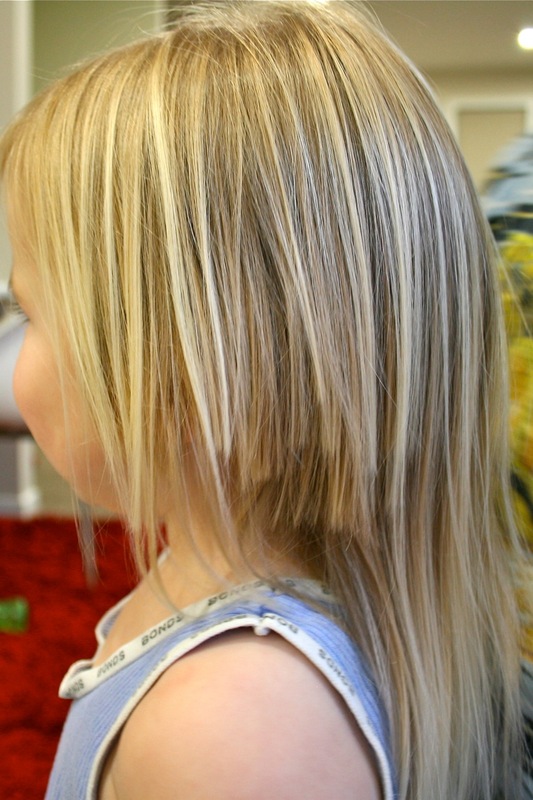 A little girl at church cut her own hair and her parents had a friend cut it in the angled bob (longer in front and shorter in back, also stacked in the back) and now they keep it that way. It suits the little girl so well and it is so much easier to take care of for a little girl. I'm not telling you what to do, but just a suggestion from a hairstylist. Hey Toni, never a dull moment with toddlers. We thought we'd removed all sharp objects from our daughter's reach until she came out with a carving knife yesterday wanting to saw a stick like mummy was doing!!! Ahhhh. Have posted about your earrings in my current post. I've included a picture of them including one of them that got damaged but you can't see it from behind so they still look gorgeous. Relax, it's only hair. Hair grows. Even it out, so it looks planned, and let it grow back. She's darling by the way. Ah, well I must say she is a doll and can carry off her new look! All of my girls did the same and my son cut up a shirt when he was really little. I also have a friend whose husband cried when their daughter chopped her hair off. I wasn't going to say anything at first, with 25 comments already I figured it was all covered, but I got thinking and had to share one thought with you. At least she doesn't have curly hair. My daughter has naturally curly hair, little ringlets, and if she ever does this it would take FOREVER to have it grow because it's in wringlets that are so tight! Oh no!!! I would probably have reacted the same way if Munchkin ever did that!! On the bright side - I do think some pins on tying her hair up until it's long enough to cut will do the trick. Toni, i was so upset! Azhie looked like the biggest bogan in the entire universe...and it was cut to the scalp so at least Lil has some hair still! Also just before her school photos. Oh No!!! I am crying, but also laughing a little. I feel for you and I have no advice even though Chloe cut her hair (she has a bob and not long hair do it does not have as much shock factor) about a month ago. Same as Lil but shorter so it is too short for clips. She does not seem to mind too much but every now and then asked if it growing yet. I still mind especially when that is the side that seems to always be in the photos. Though I tell myself it could be worse. Poor mum. I think it is pretty normal to feel upset. That was quite a lot of hair coming off. My kids did it too and being a teacher of 4-6year olds I know lots of kids do it, once! I just rather don't have them do it at school as I will get the blame! (It happened! As if I can watch 30 kids at the same time and this happens in a split second). So I guess by now you are over this sick feeling that occurs when something has happen to your child's appearance. In the US we have a style that is called a mullet, which is the front is cut short and then the back left longer. I think I would take her to the hairdresser and get it cut either leaving the back long or cutting all of her hair. It will be adorable no matter what and I think cutting their hair makes it grow thicker. The wonderful thing is that it will grow out. Just wait until she dyes it blue, gets piercings and tatoos. Love every minute of this as it really gets a lot harder and this is just God's prep work for adolescence. The best thing is - Hair Grows!